As parents and teachers we strive to promote strong character traits in children. The poem, “Children Learn What They Live,” by Dorothy Law Nolte (you can see a copy of her poem at http://www.empowermentresources.com/info2/childrenlearn.html) is the inspiration for this project. I call it Wanna Bees, as in, “I wanna be happy, or I wanna be loyal or I wanna be honest.“ To be a positive role model, I have to “wanna be” too. You’ll find directions for this project, “Wanna Bees,” in the 2nd Grade Projects Gallery in the sidebar. 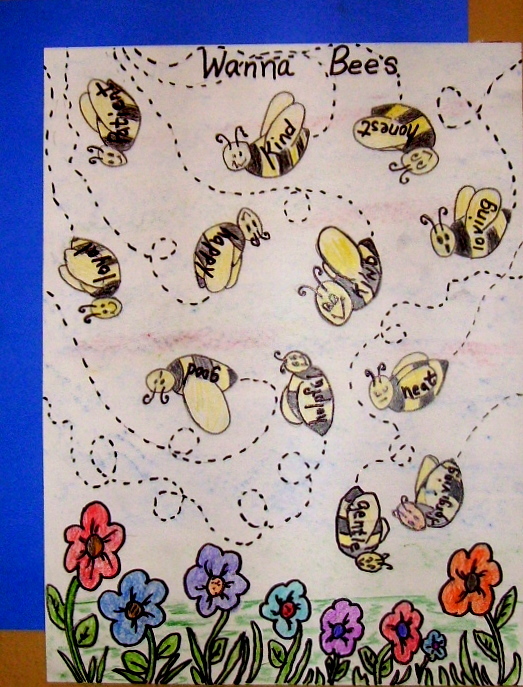 This entry was posted in 2nd Grade and tagged 2nd Grade, art and crafts for kids, bee all that you can bee, bees craft, bulletin board idea, children learn what they live poem, childrens classroom art, classroom art projects, wanna bees. Bookmark the permalink.